OK - from one day of insider EMC threads on VMware topics - three posts. 1) "What VMware features work on RDMs and which don't?'" Raw Device Mapping is something which VMware shops need to know about. They come in two modes - physical mode (pRDM), and virtual mode (vRDM). You can move a pRDM (but not a vRDM) from a physical host to a virtual and back. Useful in weird P-to-V-to-P use cases, useful in "repro that in a physical" use cases. PtoV should be a one way street, and every ISV starts embracing VMware support, so I don't think that value is a long-term use case, but important today. pRDMs can be used with array replication that provides application integration and quiescence in the application guest. 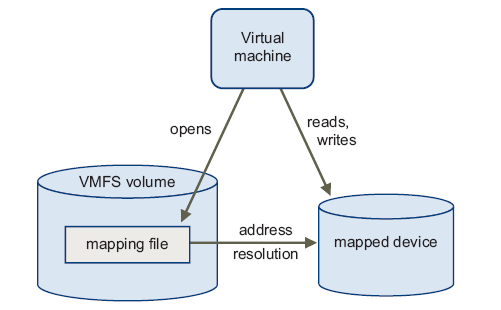 Bit by bit, we're all figuring out how to do this with VMFS (EMC can already do it with Exchange, SQL Server and Oracle to day with Replication Manager 5.1.2), so again, not a sustainable use case, but important today. So, if they are rare, and the use cases are not sustainable, why mention them? I keep getting the "pRDMs don't support VM HA/VMotion" comment. 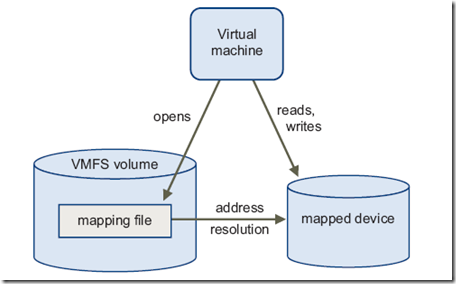 EMC Replication Manager supports VMFS volumes and file-level consistency for VMs, as well as application-integrated snapshots for apps running in the VMs. See page 144 (VMotion is supported, pRDM can’t take a native ESX snapshot, vRDM can) Features that depend on ESX snapshots (like VCB) also don’t work with pRDM, but VCB doesn’t currently support VSS backup, so they’re not going to use that for Exchange (they will use RM in this case). See page 147 for limitations (vmotion is not one of them). Moral of that story: The VMware docs are great reference material, pRDMs can be vmotioned willy nilly, and Replication Manager integration with VMware is matched only by SnapManager for Virtual Infrastructure from Netapp (each have a couple minor things over each other). I haven't been able to test it though. Right - translating what VSS support means has been difficult since it's introduction. - Volume Shadow Copy services as a 3-way API operation including a writer (think "application integration module"), a requestor (think "backup application running on the host"), and the same provider mechanism used for generic NTFS file-consistent backups. For example on the latter - Exchange 2003 and 2007 ship with VSS writers (as does SQL server). A VSS requestor calls those VSS writer APIs to initiate application specific behavior during backup and restore. For exmaple in Exchange's case flushing and closing the current open log during backup, handling validation of the backup, and during restore, triggering and handling log replay. In otherwords "application level consistency actions". Then the VSS provider kicks in. What happens in 3.5 u2 is that now, just like array-based replicas who's vendors created VSS providers that operate inplace of Microsoft's system provider, ESX snapshots now act as a VSS provider, and you get NTFS-consistent backups. BTW - homework excercise for anyone with XP, or W2K3 or W2K8 - right click on any NTFS volume, go to "properties", then "previous versions" - that's native VSS. Supporting VSS (and the storport driver stack, which is the big change in u2) is a mandatory pre-requisite to application-integrated VSS. So, now people who have created VSS requestors for various applications can operate inside the guest, and leverage the native ESX snapshots for the underlying point-in-time copy. Examples of this are most backup applications (EMC's included), EMC Replication Manager and the NetApp SnapManager family (both of which are designed to integrate array-based replicas). EMC Replication Manager supported app-consistent replicas for SQL Server and Oracle in VMs before this change, because there you have other APIs for the same thing (SQL can use VSS and VDI - virtual device interface - not Virtual Desktop Infrastructure, Oracle has hot-backup mode), but this was mandatory for us to support Exchange 2003 and 2007 in VMs with app-integrated backup and recovery. RDM's will work with vmotion except if RDMs are used with Microsoft Cluster Services in which case SCSI bus sharing is enabled and the vm cannot be vmotioned.